If you’re ready to hire experts to repaint your home’s interior, you have thousands of options – and in addition to color, it’s up to you to choose the right finish. But what’s the difference between satin and flat, or glossy and matte? Here’s what you need to know about paint finishes. Typically used in bathrooms and hallways, flat enamel has a lusterless, nonreflective and durable surface. This type of finish is common in rooms where the air is damp and the walls need to be cleaned more frequently. Semi-gloss is generally easy to clean. It reflects light, but not too much – it’s usually used on doors and cabinets in kitchens and bathrooms. 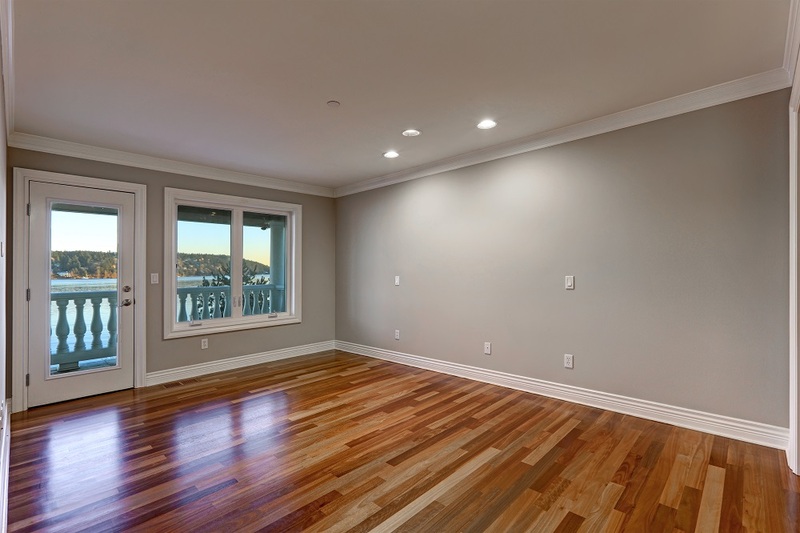 Semi-gloss paint looks best on very carefully prepared walls and surfaces; imperfections in the surface beneath the paint really stand out on the finished product, so it’s best to hire professionals if you’re using this type of paint. What is Glossy Finish Paint? Glossy finish paint is highly reflective, and it’s shiny. Some people say it looks a little like plastic when it’s dry. Most often, glossy finish paint is used to create a dramatic effect (such as on trim or cabinets). Imperfect surfaces shouldn’t be painted with a glossy finish, because like its semi-gloss counterpart, it causes imperfections to stand out. Satin paint finish is moderately glossy, and it’s probably the most commonly used type. You’ll see it on interior wood trim, ceilings and window trim, kitchens and dining rooms, and in hallways. It can stand up to light washing, so it’s good for high-traffic rooms in the house. What is Matte Finish Paint? Matte finish is also referred to as “flat finish,” and it doesn’t reflect much light. Many homes feature matte finish paint because it’s great for hiding imperfections in the walls (like cracks and bumps). The downside to matte finish is that it’s difficult to clean. It’s usually best-suited for bedrooms and other rooms that don’t get a lot of through traffic. Many homes feature several types of paint – it just depends on which room you’re using it in. It’s common to find semi-gloss in the kitchens and bathrooms, satin paint in the kitchen, and matte finish on the ceilings. When you’re choosing new paint for your home, your paint pros will help you weigh the benefits of each type so you can make the right decision. The idea is to create the longest-lasting, most durable and most attractive blend for each room, and Mack Painters can help you do that. Do You Need to Talk to Pinehurst’s Painting Experts? When you’re ready to talk about the colors and finishes you need in any room, we’re here to help. Call us at 910-725-3227 or get in touch with us online. We’ll be happy to answer your questions and give you a free painting estimate for any of our services. Painted cabinets can transform an ordinary kitchen or bathroom into an extraordinary one – but how do you know if they’re the right choice for you, and if they are, what colors should you choose? Painted cabinets can define your space’s color palette, but how can you tell if it’s the right choice in your home? Have a look at the pros and cons. Painting your cabinets in the kitchen or bathroom is much more cost-effective than replacing them entirely. A fresh coat of paint makes your cabinets look brand-new. You can create a look you love – and you can use just about any color you want, with the option to change it again in a few years. Not all cabinets are good candidates for paint. If they’re warped, chipped or otherwise damaged, you may need to replace them instead. Painting them yourself is a time-intensive job – you have to take the doors off the hinges and clean them exceptionally well. You have to prime, paint, and put it all back, too. You have to paint carefully if you’re an amateur, or you’ll probably be unhappy with the results. What Colors Should You Use to Paint Your Cabinets? Pro Tip: You can paint only the interior of your cabinets to add depth, which is a great choice if you have windowed cabinets. Lacquered cabinets reflect light and make your space appear larger, so you may want to gloss over your paint job when you’re done – especially if you live in a small space. If you’re painting your home’s interior on your own, especially if it’s your first time through this, you need a solid way to figure out how much paint you’ll need. There’s a mathematical formula you can use to figure out how much paint you need – and it’ll work whether you’re painting a small bathroom, a big kitchen, or the entire house. As a general rule, you can get about 400 square feet of painted surface from one gallon of paint. However, some paints provide more – and some provide less. It’s better to have more than you need than less than you need, so round up! Pro Tip: Even if a can of paint says you only need one coat to completely cover another color, be leery – that’s a bold claim to make, and we haven’t found any that can actually live up to that promise. The way to figure out how much paint you need is to add up the square feet you need painted, then divide it by 400. The resulting number is the number of gallons you need to buy… but don’t forget to round up. Pro Tip: If you know you’ll need 5 gallons, buy a 5-gallon bucket of paint – don’t buy five 1-gallon cans. Semi-gloss paints usually require more coats than flat paints do. If you buy 3 gallons of paint, mix them all together before you start painting – that way you can be sure the color is perfectly matched. Standard doors are 21 square feet. We can handle all your interior painting for you – just call us at 910-725-3227. We’ll be happy to give you a free painting estimate for any of our services. Aberdeen, Pinehurst, Southern Pines and Myrtle Beach painting pros are right here waiting to help. If you’re remodeling your kitchen, or if you just want to freshen up its appearance, a new paint job is in order – but what if you don’t want run-of-the-mill, plain walls? Check out these five creative kitchen painting ideas. How can you turn your kitchen into a dream space with paint? Check out these five creative kitchen painting ideas. When you choose a new color for your kitchen, it can be pretty overwhelming – but if you limit yourself to just the ceiling (or even an accent wall), you can create a fresh, amazing look. Paint a whole section of a wall – maybe the one that juts out on the side of your refrigerator – as a chalkboard. You can also add a colored border for added effect. Choose colors that sit beside each other on the color wheel and remember that warm colors look great with cool colors, and create a blocked look by painting upper cabinets one color and lower cabinets the other. Painting the inside of your cabinets – particularly if your cabinet doors have windows – can create a wonderful look. It can also give you time to adjust to a new color. Pro Tip: Glossy paint reflects light, and it can brighten and open up your kitchen. Paint your pantry to try out a new shade or design. It’s also a great way to add color that’s too bold to use elsewhere. Want to Spruce Up Your Kitchen With Paint? We can repaint your kitchen for you and make it look amazing – just call us at 910-725-3227. We’ll be happy to give you a free painting estimate for any of our services. Aberdeen, Pinehurst, Southern Pines and Myrtle Beach painting pros are right here waiting to help. If you’re like most DIY home painters, you know that latex drips running down the wall and paint splatters on the carpet are almost inevitable – but how do you fix them? Seeing dried latex paint drips that ran down the wall before you could catch them is definitely one of those moments you think about how you should’ve hired a professional painter, but don’t worry too much. You can fix them without causing too much damage to all your hard work! Sand down the drip or spill until its surface is smooth. Clean off the area with a damp cloth. Repaint over the spot, if necessary. To remove drips from floors, use a razor blade – just run it beneath the drip carefully and peel it away. Pro Tip: Use drop cloths and painter’s tape next time. Also, cover door knobs with plastic bags and tape them in place, and remove outlet covers and tape over the outlets. Whether you splattered a little paint on the carpet while you were working on the corners or your ladder tipped over with your roller and tray, you may be able to make things right – but you have to act fast. Use a scraper to pick up as much of the wet paint as you can. Don’t spread it on clean areas of the carpet! Use a thick, dry sponge to soak up paint you can’t get with the scraper. You might have to go through several clean sponges. Place a clean, dry cloth over the spot. Leave it there until it picks up the stain, then change it out for another clean, dry cloth. Clean the area with warm water and dish soap once the stain is gone. Allow it to dry completely. If the stain is already dry, you can buy a paint remover solution – but be careful. Test it in an inconspicuous area before you use it out in the open. We can help you avoid these issues – just call us at 910-725-3227. We’ll be happy to give you a free painting estimate for any of our services. Aberdeen, Pinehurst, Southern Pines and Myrtle Beach painting pros are right here waiting to help. For many people, it’s a great question – should you paint your garage floor? While painting the garage floor doesn’t make sense for some people, it’s worth noting that a painted floor can be easier to maintain (not to mention it looks better). Here are four reasons you might want to break out the paint and rollers. A lot of the dust in your garage actually comes from the concrete on the floor. Over time, it breaks down – and the problem is exacerbated each time you pull in, walk on it, or slide boxes from one side to the other. The dust produced by the breakdown goes airborne and gets all over everything. Some paints help resist oil stains, chemical breakdowns, water and mold. Provided you clean up when something hits the floor, you won’t have to look at spotted concrete any longer. Forget being stuck in a dimly lit garage – paint reflects light, whereas bare concrete absorbs it. The result: a brighter environment. You can create a look you actually like in the garage (what a great way to welcome yourself home after a long day, right?). Paints that are suitable for garage floors come in a huge variety of colors, which means you can completely personalize the space. Thinking About Painting Your Garage Floor? While you can take a DIY approach to painting your garage floor, remember that Aberdeen, Pinehurst, Southern Pines and Myrtle Beach painting pros are right here waiting to help. Call us at 910-725-3227. We’ll be happy to give you a free painting estimate for any of our services, too, so call today! In 1978, lead paint was banned for home use – but many houses in Aberdeen, Pinehurst, Southern Pines and Myrtle Beach are older than that. And some of them still have lead paint on their interior walls. So what should you do if you think you have lead paint in your home? Lead paint can have serious health hazards, but you might not know it’s there. According to the EPA, lead paint is still in millions of homes across the U.S. – and sometimes it’s under several layers of new paint. As long as the paint covering it is in good shape, it’s usually not a problem. If it is cracked, peeled or chipped, or if it’s on window sills, doors and door frames, or stairs, railings, banisters or porches, you’re at risk. You may want to have your home tested. Should You Have Your Home Tested for Lead Paint? Was the home built before 1978? Do walls, window sills or other surfaces in your home have chipped or peeling paint? Pick up any paint chips you find anywhere. Clean the dust off window sills and other surfaces often. You can contact the National Lead Information Center at 800-424-LEAD for help finding a professional near you. Once all the lead paint is safely removed, you can call in an interior painting expert to give your home a fresh coat of paint. Call us at 910-725-3227. We’ll be happy to give you a free painting estimate for any of our services, too, so call today! If you’re like many people, you’ve seen how bad a hole in drywall looks – and if you need to paint over one, you know that it’s tough to get it just right. There are basically three categories of holes in drywall: Small, Medium and Large. The size of the hole will dictate how you fix it. Place a self-adhesive mesh patch over the hole. Use a drywall knife to cover the patch with joint compound. Feather the edges so it blends into the wall. Apply a second coat of compound if necessary, but wait until the first patch dries. Sand the patch down so it’s smooth. Cut a piece of drywall into a square that’s about 2 inches larger than the hole. Score the back of the drywall about 1 inch inside its borders. Make the cuts close for a perforated effect. Break off the gypsum without tearing the paper backing. Hold the cut drywall over the hole and trace its outline. Don’t outline the paper – just the drywall. Cut out the traced square with a drywall knife. Spread joint compound on the back of the paper. Put the cut drywall in the hole and smooth the paper edges over the wall. Cover the whole patch with joint compound and feather the edges. Apply a second coat of compound when the first is dry. Cut a piece of drywall into a square that’s larger than the hole. Hold the square over the drywall and trace around its edges. Cut a hole in the drywall that matches your patch using a drywall knife. Add a small, thin piece of wood to each side of the hole from the inside, using screws on the outside. Sink the screws beneath the drywall’s surface so you can patch them later. Put the drywall patch in place and screw it to the wooden strips inside the hole. Affix joint tape all around the patch. Cover the patch and the joint tape with joint compound. Feather the edges. Want to Skip All This Hassle? We can handle this for you and repaint your wall so it looks like there was never a hole there in the first place. We work in Aberdeen, Pinehurst, Southern Pines and Myrtle Beach. Call us at 910-725-3227 to get a free painting estimate for any of our services today!